Waste-Away Group : What is Green Power? Renewable energy is power that comes from sources that are able to renew themselves and regenerate within a relatively short period of time, unlike conventional power methods. 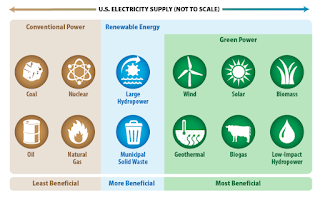 Renewable energy sources include things like wind, sun (solar), moving water (hydropower), the Earth’s heat (geothermal), and “organic plant and waste material (eligible biomass).” Although large hydroelectric plants can effect fisheries and have other environmental issues such as land use, renewable energy sources are thought to be of low impact to the environment overall. Green power “is a subset of renewable energy and represents those renewable energy resources and technologies that provide the highest environmental benefit. 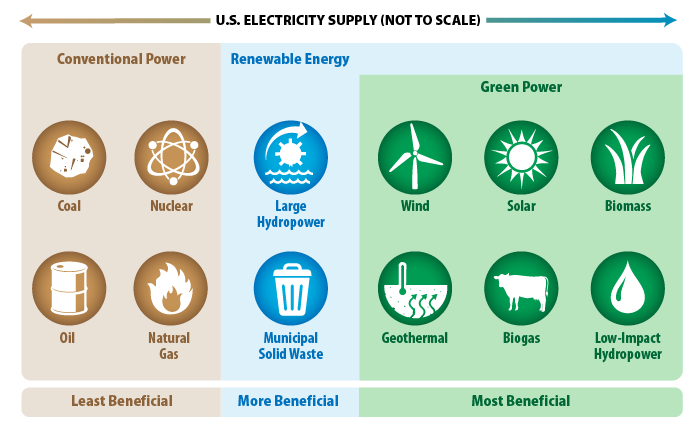 EPA defines green power as electricity produced from solar, wind, geothermal, biogas, eligible biomass, and low-impact small hydroelectric sources. Customers often buy green power for its zero emissions profile and carbon footprint reduction benefits.” (EPA) Green power greatly reduces the carbon footprint associated with our choice of power that we purchase. For more information on recycling and renewable resources visit www.wasteawaygroup.com.